What is the biggest demand of customers today? A seamless buying experience. If you have noticed – the term “omni-channel” has been popping up a lot off late in marketing blogs and other resources. It is defined as a multi-channel sales approach that offers an integrated shopping experience to customers. Most companies focus on devising a multi-channel marketing strategy, including social media, website and pushes, which still leave some room for consistent messaging across all channels. Omni-channel marketing, on the other hand, allows companies to align their content and design across all platforms. The customer could be shopping online from a desktop or a mobile device, by telephone or in a physical store – and the experience would be seamless. Delivering personalized and satisfying customer experiences is the top data and predictive analytics strategy and priority. 62% of companies plan to implement an omni-channel strategy. 70% of companies consider omni-channel marketing to be very important. Whether it is B2B or B2C, the modern purchasing behaviour is largely driven by personalized engagement – and this is where this technique takes the cake. It lets the customer control the buying process and steer it in whichever way (s)he likes. The point is that through this, no selling or engagement opportunities are lost and the companies get to know their customers better. 78% of companies currently realize or expect a sales lift with an integrated omni-channel marketing strategy. 49% of customers are comfortable with brands collecting personal data. They expect interactions to be real-time and tailored as per their buying preferences and transactional history. Using marketing automation, it is possible to create rich consumer profiles covering every detail of their buying behaviour. Today, companies like Wigzo offer tools that enable marketers to reach out to all customers through personalized emailers, browser and mobile notifications – but tailored to the customer interests. For instance: Male iOS users, working in the tech industry and of ages between 25 and 35, are more likely to buy based on the product’s technical specifications. If you discover you are marketing to them, you must highlight specifications in your landing pages and nurturing strategies. Here, consistency is a central principle of a strong consumer experience. 57% of them expect promotions to be consistent across online, offline and and social touch points. Brands should be able to empower customers to make the best purchasing decisions to create loyalists. For instance: You added a pair of shoes from Zappos to your shopping cart via your mobile. Later, you viewed the same pair of shoes on the laptop at home – but didn’t make a purchase. 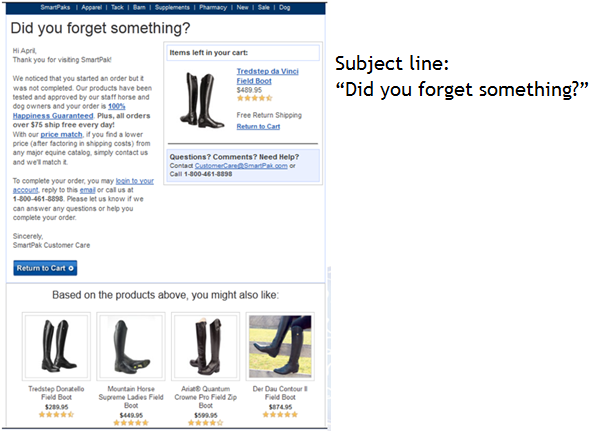 Finally, on a sunday afternoon, you get an email from Zappos with the subject line “You snooze, You Lose” or “Did you forget something?” – with an image of your shopping cart, the shoes and a bright orange tag that says “Only 1 LEFT!” as the content. What do you do? You end up buying the shoes! Zappos, conveniently, not only informed you about the product but also empowered you to buy! Capturing connected customers depends on a brand to take a fast approach. Businesses must adapt to tools and analytics to re-organize market changes and shifts in buyer behaviour – along with scalable systems that enable fast action when opportunities arise. Take the example of Starbucks reward app: The consumer can use the card every time (s)he makes a purchase. The global brand has made it possible to check and reload the card via phone, website, in-store or on the app – unlike most of the B2Cs. Even the slightest change made by the customer is reflected across all channels – in real-time! So, if the customer is standing in line to get a cuppa and realizes there isn’t enough balance left. (S)He can reload it then and there, and the cashier will know it has been updated by the time (s)he turns up at the counter. You CAN ensure a unique omni-channel marketing infrastructure, if you not only choose the right methods to collate data but also to promote it. Use social media to promote and engage your message to a larger, viral audience. Personalized micro websites using PURLS and GURLS help measure click-through rates from the campaign. Know when who and how many respond through the robust email tracking software. Track SMS or text messages to refine your message and improve data quality. Receive and analyze reports of your direct mail delivery. Don’t forget that the importance of an amazing brand experience can turn a customer into a brand advocate. Creating an equally seamless customer dialogue across every stage of the buying journey is important – and omni-channel marketing ensure just that!